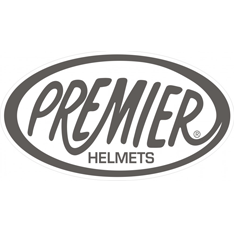 Premier have managed to retain a compact shell size in keeping with the original 70’s helmet without compromising safety. There are no vents and the visor is retained by two screws and friction plates, when closed it is secured by press studs (again in keeping with the original). The visor will not seal like a modern visor, the helmet is trying to stay true to the style of the original rather than provide a host of modern technical features.